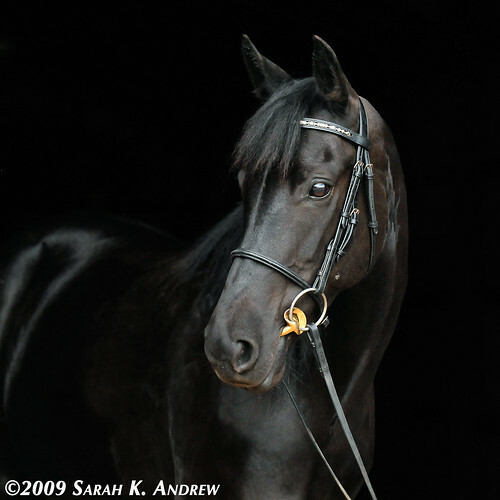 In the photo above, my friend’s dearly-departed Morgan, Mary, is modeling the Stubben Golden Wings bit. The bit does not fit my friend’s new mare, so Wizard gave it a try. We began our ride outdoors. The air was cool but damp from all the recent rain and humidity. All my tack got moldy from not riding for almost a week :^P Wizard was energetic but not evasive. He happily purred while we rode. Something about the cool air, the bit, and the time off seemed to agree with him, and he was FABULOUS. He was taking contact, and I was able to keep my hands right there with him instead of feeding the reins through with my fingers or creeping the reins up when he stretched into the bit. I think the Stubben is SO mild that Wizard is comfortable sitting on it a little more than his usual bits. All of our bits are extremely mild, but this one seemed to sit in his mouth like butter. We worked on some lateral exercises, and I worked diligently on using my calf instead of poking him with my heel (awful habit that I fall into sometimes). We did some lengthening of our gaits, and I got the most BRILLIANT trot out of him. It was pretty close to a real extended trot- the tempo did not increase, but his stride lengthened and he really pushed with the hind end. ← Wizard Rides 286 & 287: Is It Magic That Makes You Appear? Oh Mary! She sure was a beauty! Yay for bits that make horses happy! Casey seems to prefer eggbutts. I know he was trained in an O-ring, but he really seems happiest in an eggbutt, which is fine with me as I seem to have a dozen of them. One can never tell what bit will make a horse happy! I have an army of bits, and the fancy-pants Golden Wings is a good fit for now. Hooray! Mary really was a lovely girl, wasn’t she? I know! I like eggbutts, but all the trainers I know hate them! Interestingly enough, since he has some sort of reining training in his background, you’d think he’d be down with a Western big boy bit, right? Nope! He’s ok with an Argentine snaffle, but not nearly as happy as with an eggbutt. I guess he’s made it clear as to what style of riding he wants to do! Out of curiosity, how thick/thin is the mouthpiece?